The "Father of the Green Revolution in India", Professor M. S. Swaminathan drew a big audience when he held a guest lecture at UMB on "Sustainable Food Security in an Era of Climate Change" . 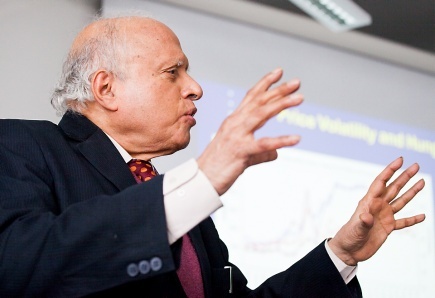 It was standing room only when Professor M. S. Swaminathan arrived at Norwegian University of Life Sciences to give his advertised talk on "Sustainable Food Security in an Era of Climate Change" this Tuesday. The crowd of scientists and students listened attentively and learned about biohappiness, biodiversity and the green end ever-green revolution pathways, including the dangers ahead. - Biohappiness results from the conservation, sustainable and equitable use of biodiversity and the blending of traditional knowledge with frontier technology, said M.S. Swaminathan. Do you want to read the lecture? You will find it here!